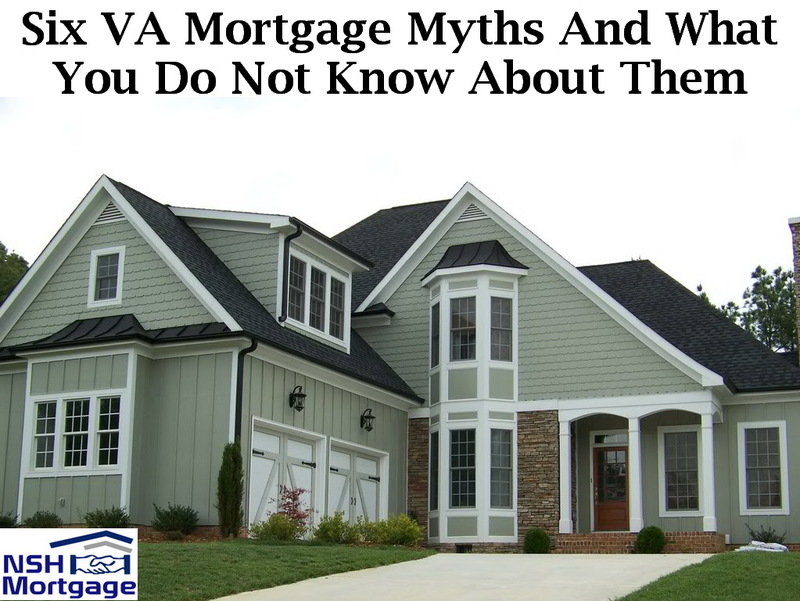 Six VA Mortgage Myths. NSH Mortgage has the knowledge and tools to help you understand what you do not know about these six VA mortgage myths. The VA mortgage is arguably the best mortgage available. However, many home sellers, real estate agents and consumers make some incorrect assumptions about the program, and how it can affect your ability to use these product. If you are eligible to use this home loan, do not let someone else’s ignorance cost you money by keeping you from applying for a VA mortgage. So if you encounter a home seller, listing agent, or anyone else who wants to dissuade you from using a VA home loan, set them straight with this article. That is not true, because rules about fees were only created to prevent service providers from overcharging veterans. For instance, a VA buyer cannot be charged a commission by the real estate agent for finding property. But real estate commissions are traditionally paid by the seller anyway. Lender miscellaneous charges (aka junk fees) when the borrower is already paying an origination fee. The origination charge cannot exceed one percent of the loan balance unless the mortgage is a construction loan. HUD or FHA inspection fees that home builders normally pay. Prepayment penalties for the seller’s existing mortgage. Attorneys fees charged by the lender. However, you can pay reasonable, customary costs for title work, which may include attorney services. For nearly every transaction, home sellers do not pay any more for a VA borrower than they would a conventional mortgage borrower. For example, if the market interest rate is at 4.25%. With one origination and one discount point, your seller can pay that and your other closing costs. That does not count toward the seller concession limit. Suppose your debt to income ratio is too high because of credit card balances that total three percent of the property value. You want the house, but cannot qualify for the VA mortgage. The seller could choose to pay those balances off for you to help you qualify for the loan, and pay an additional discount point to reduce your mortgage rate and make the home more affordable. Of course, if the seller is getting a higher price for the house to offset these concessions. The property will have to be appraise for at least the sales price to make the deal fly. Another concern for sellers is that VA mortgages take a long time to close. That is also not true. According to mortgage industry analysts, the average VA mortgage closes in about 45 days, while the average closing time for all other loans are normally 42 days, but this difference is just a mere three days. As a buyer, you can relieve the seller’s concern by getting pre-approved for your VA mortgage so you can close much faster. That means submitting an application, authorizing a credit report, and documenting your income and assets. Mortgage pre-approval, also called credit approval, means that you are good to go. This can help you close since the property meets the lender’s guidelines. If all you need is an appraisal to close, you can probably get that in ten days or fewer. You or your home seller may think that it does not matter which VA lender you choose. And finding out at which value that the federal government uses to sets up the VA mortgage rates. Your agent or the seller’s agent may even push you to use their preferred lender, and you might think that all lenders are the same and charge the same rate. The fact is that the government does not lend money for VA home loans. It simply insures them, which protects the lender if you default. Private sector lenders make VA mortgages and set their own interest rates and loan charges. It is up to you to shop and compare offers from competing lenders. You can certainly get an interest rate quote from a preferred lender, but compare that with quotes from additional lenders to get your best deal. In fact, VA mortgages make it easier to qualify, and that most of the process is automated and speedy. For instance, your lender can probably obtain your Certificate of Eligibility (COE) electronically, and underwrite your mortgage the same way. The only real difference is that you need a VA appraisal from a VA approved appraiser, and that may cost a little more and take a little longer. Besides the property value, the VA appraisal must show that the home is safe and livable. The VA maintains a list of MPRs the property must meet to be eligible for financing. That is only sort of true. While 100 percent VA home loans are limited, if you are willing to make a down payment, you can borrow as much as a lender is willing to lend. You just have to put down 25 percent of the excess purchase price. For instance, if the VA loan limit in your area is $500,000, and you want to buy a $600,000 house, you would have to put down 25 percent of the amount over $500,000. Here, the excess is $100,000, so you would make a down payment of $25,000. That means you put down 4.2 percent of the purchase price and pay no mortgage insurance which is a great deal by anyone’s standards.